Scientists in Germany flipped the switch on what's being described as "the world's largest artificial sun," a device they hope will help shed light on new ways of making climate-friendly fuels. The giant honeycomb-like setup of 149 spotlights — officially known as "Synlight" — in Juelich, about 30 kilometers (19 miles) west of Cologne, uses xenon short-arc lamps normally found in cinemas to simulate natural sunlight that's often in short supply in Germany at this time of year. By focusing the entire array on a single 20-by-20 centimeter (8x8 inch) spot, scientists from the German Aerospace Center, or DLR , will be able to produce the equivalent of 10,000 times the amount of solar radiation that would normally shine on the same surface. Creating such furnace-like conditions — with temperatures of up to 3,000 degrees Celsius (5,432 Fahrenheit) — is key to testing novel ways of making hydrogen, according to Bernhard Hoffschmidt, the director of DLR's Institute for Solar Research. Many consider hydrogen to be the fuel of the future because it produces no carbon emissions when burned, meaning it doesn't add to global warming. But since hydrogen doesn't occur naturally, it first has to be made by splitting water into its two components — the other being oxygen — in a process that currently requires large amounts of electricity. Hoffschmidt said the dazzling display is designed to take experiments done in smaller labs to the next level, adding that once researchers have mastered hydrogen-making techniques with Synlight's 350-kilowatt array, the process could be scaled up ten-fold on the way to reaching a level fit for industry in about a decade. 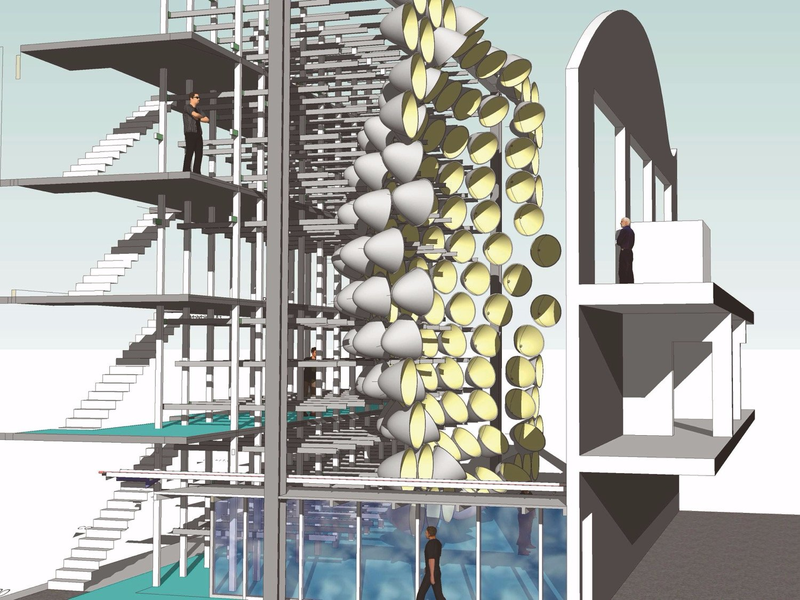 The goal is to eventually use actual sunlight rather than the artificial light produced at the Juelich experiment, which cost 3.5 million euros ($3.8 million) to build and requires as much electricity in four hours as a four-person household would use in a year. Hoffschmidt conceded that hydrogen isn't without its problems — for one thing it's incredibly volatile — but by combining it with carbon monoxide produced from renewable sources, scientists would, for example, be able to make eco-friendly kerosene for the aviation industry.